I headed down south to Florida a bit late, as I spent a couple months helping out my ma and sister again. Natalie (my niece) has grown into a kid now, and by the end of February this year, I was no longer needed for child care,and headed south. My winters will be free again from now on, so I took up the task of leaving behind the past and establishing a new place and routine for the winter season. I decided that this year my goal would be to finally leave the Keys behind forever and move the boats up to central Florida, in or near a boatyard, to work on them next winter. When I arrived though I found a real mess. The guy I'd let stay on my boats had turned out to be a total derelict. I don't know what his problem was.. drugs or alcohol or senility or all three; it didn't really matter. the end result was I arrived to find the Hurley up on the beach (though I'd paid someone to chain it to my mooring), both my dingys and the outboard gone, and a few inches of bird droppings accummulated on the deck of the steel boat. No fun at all. I don't have time and space to cover the details, but through a combination of sincere capability, and some luck, and a little pivitol help from a few good people; I managed to get everything together again and ready to leave. The biggest pain was that it took 6 weeks, time I didn't have to waste. That was perhaps the worst aspect, that most of the work was unnescessary, the direct result of someone else's messing up everything. Though as I said to one person, I don't regret trying to help them.. that is what I do, try to help people, and I can never guarantee which ones deserve it and which don't, and which will be helped and which just betray my trust and cause me trouble. My mistake, I said, was that I trusted him to do anything he said, left things depending on him following through on his word, and gave in to his entreates to do just that.. go out on a limb for him. I also agreed to help out Hughie and pilot him and his boat to Belize, and get him out of Key West too before I left for good. He was caught in the undertow, and honest enough to admit it, and asked for my help. He's a good man, really, and has helped out a lot of people in his day without asking for anything, and been there when he was needed. So I did it, and I'm glad I did, even though I didn't have the time and it was a bit of a nightmare trip. Though I was under no illusions really that it wouldn't be, though I had hopes that it might go easier than it did. I didn't get to go all the places I'd hoped, but at least I made it down again, and it reinvigorated my resolve to relocate my winter homeport in that area. Yet to be at sea again, standing at the wheel through the long night watch, steering by a star, or just the feel of the ship balance just right on wind and wave. The storms, and the times the seas would wash over the boat up to our knees as we stood holding the wheel. Or the big combers we plowed through off the coast of Mexico, which buried us in white water over out heads as we held on and I kept her pointed sure and true. It was the time we were racing in through the reef when we lost the main halyard block, when my knowledge proved its worth, that I knew just where we were, and was able to turn and race in to shelter in the bay, bring us in to anchor by Celubra Key for several days of repairs. It was wandering around Isla Mujeres again, and ine afternoon stopping and teaching a young guy a good guitar lesson with the help of my dictionario and the universal language of music, passing it on; or another time at night, taking a guitar and playing "So Fine" in the narrow street, the sudden silence as people step out to listen, the sudden applause after I finish..that strange magic again . It was dolphins playing before the bows, or congratulating Hughie with each landfall, the steps to a new life. It was meeting up with old friends again, musicians and painters, at their place on the island, their refuge. All the broken bits of scenes, but all good, even if it was a bit brutal... the boat overun with cockroaches, Hughie dealing with going cold turkey on his alcoholism, yet still coming through when he had to as well. I got sick on bad water in the ships tanks, and still had watches to stand, and navigation all the way. It was the effort if sheer endurance when I had to be navigating the whole trip, on call at any minute, aware of what the ship was doing in case Hughie wandered when I wasn't at the wheel, waking up every 30 minutes sometimes to check our position along the reef, sometimes not sleeping at all. The delays and repairs and dissappointment as I had to sail right by the places I wanted to stop, yet also promising I'd be back. It was intenese, but I am glad to have done it and would do it again.. because Hughie was worth helping. And as for the trip, I'll do it again, but in my boat next time. Perhaps the most impressive moment for me, oddly, was when I got back. One of the few people I actually respect within the Key West community, upon hearing the news that I'd seen Hughie and his boat safely to Belize City, and as much, away from KW forever; yelled at me as our boats passed each other, "you are a true hero!" Maybe its just my odd way, but that unasked for title means a lot to me in the course of a life, to have been called a hero. Its something. I finished up the last details, moorings sold to and set up for my friends on "Koyote". Finally I was down to watching the weather day by day. I finally got a good, even perfect, weather report..."winds light and variable, 5 knots or less" from the NOAA radio, and I headed out. I first headed straight north, a 90 mile shot across open water to cross the bay and cut 50 miles or more off the trip. But the weather was too rough for the using the outboard, which gets lifted out of the water if the seas are too big especially from certain directions. So I went back to my original plan, staying close to shore and heading up the keys, my planned anchorage at the Content Keys, 30 miles ahead. But within a few hours the wind did die and I turned and headed north, with the weather report still great. 40 miles later, almost midway, and 40 miles from land in any direction, NOAA's weather report turned out to be less than useless and dangerously wrong. I can't say that I shouldn't have known, they are often useless.. and often, like this, criminally negligent for the job they are supposed to be doing. Lives depend upon their forcasts, yet they, as in this time, never give warning when, though they are predicting good weather, there is a possibility of serious conditions if their predictions prove wrong. Well, they were wrong and I spent the next 30 hours dealing with extreme gale conditions in massive thunderstorms. It wouldn't have been so bad even if I'd not had to deal with two boats, three counting the dingy, and I had some really bad times dealing with it when they got too close together in the huge waves. I could have possibly rigged a sea anchor, but I was drifting closer to shore, while still having plenty safety margin, so I took the drift to give me more chance of making the run to shore when conditions improved, since I quite easily could be faced with a short lull, then strong offshore winds building fast. Finally wind and seas moderated, and I got the outboard, which had been underwater half the time, to run, and I took the only course the seas allowed, running east towards shore; luckily not forcing me south, though not allowing me to go north either. It was a struggle through the dawn and morning as I fought my way east. Finally in the afternoon the winds did as expected after a storm and dropped. I could of altered course north, and did a bit, but I wanted that shelter of land before east winds built, and because after days without sleep and intense struggle, I had to be able to anchor in a lee and rest. I came into sight land in a near calm, and kept pushing up the coast north even as the wind rose from the east. With my batteries dead and no lights but my spotlight, I pushed on till dark. By a strange coincidence, I had made one of my planned anchorages, Indian Key, and the same day I would have made it if I had come up the coast non-stop. Though if I had continued up the coast, I would have been trapped in my first anchorage instead untill this same day, so I actually had gained 80 miles, even with the time adrift. I cast my anchors in a protected cove and gratefully collapsed into exhausted sleep. well.. I should get on with the story.. The wind built slowly through the night and by morning NOAA was (this time) issuing small craft advisories for the afternoon. I was snug and figured to take a recovery day.. but after coffee and with breakfast still in the pan I was looking at the charts and deciding if I left immedieately, I could make the run for the entrance to the inland passage where I'd be able to continue despite the weather. I could hug the shore the whole way and in the worst case, head in and find a new nook to anchor in if nescessary. I was already appreciating my shallow draft, and it really made the difference, even at Indian Key where I anchored in 6 feet of water without a qualm. I made it, though at the entrance to the passage the outboard died and I had to anchor. It took a couple hours but I finally found one of the problems and jury-rigged a solution that got it running again. There was just enough light left to make the short trip a mile in to a spot to anchor, where I could row into a small town. Later, I did, and called my relatives to let them know where I was, and get water. I was able to make a full day's run up the coast even as the wind blew, though the passage was pretty shallow and narrow in spots. I remember it as a good day, except for the boat traffic, I was often in the natural peace of mangrove back-country, relaxing in a relatively low level of stress where even any trouble would find me in a protected place. The next day however I made a serious judgement call. The wind was up and blowing strong and predicted to last indefinitely, but the inside passage had ended. I went for it, and struggling out the openning, I immedieately cut back into shore and headed north using my shallow draft to stay just 100 yards off the beach, right at the border where the chop turned into waves that turned to whitecaps just offshore of me. I held on all day, and just before sunset I again made a very rough run out and around and into the entrance to the protected harbor at Ft. Meyers Beach. It was a terrible anchorage though, a nightmare realy. Crowded with boats, with the by now really high wind funnelling down through and opposite a heavy tide rip. I had four anchors out and still had to struggle to keep from tangling in my rode and possibly dragging. But I spent a day there shopping, doing laundry, and getting water. I though of even staying a second day, but by the next morning I wanted to leave, and timing the morning easing of the wind and an outgoing tide, I ran the open water and went through the first drawbridge letting me into Pine Island Sound and the entrance to the Caloosahatchee River and the cross-Florida canal. Drom there on I could expect protected waters. Well, I did, but the next few hours were some of the worst as I was pummelled by huge motoryacht wakes that once even swamped and killed the outboard for a difficult half-hour getting it going amid the wakes. The air was literally filled with a fog of mist from the boat's spraying water. Using my emergency bateries hooked up to my running lights I pressed on after dark to make what looked like a good anchorage that put me past Fort Meyers and the wide part of the river, both beyond the traffic nightmare, and the wide outer river that gave much less protection from the deteriorating weather. It turned out to be a good spot, though it was a pretty tough bit of navigation getting there in the darkness of an overcast night. But I slept safe and sound even as storms marched through in the night. In the morning I headed on through the canal and its locks. I almost had a nice uneventful trip, and it wasn't really bad. Mostly it was long days motoring up the narrow canal, watching the tidewater turn to riverbank, and the riverbank change from trees and thickets to orchards and finally wide-open cattle pastures. Sometimes we cruised past mansions and sometimes old shacks, other times we passed through wildlands, with big and small alligators watching is from the banks and inlets. It was a holiday weekend, and I passed parties on the banks, but never stopped nor was asked to. We anchored by an abandoned house just a few short of a small town, bridges, and a lock. Yeah, the lock where the outboard decided to die again just as I tried to pull out...turning a simple chore into a embarassing pain.. though I got it started and got on my way without too much delay. That afternoon I cast my anchors at the Glades boatyard. I'd made it.. though really, I wasn't nearly done yet. But that night I wander about the yard, and used the phome to call into to my folks, and luxuriated in the feeling of having made it this far, and cracked a tough nut for sure. But things just weren't going to be so easy, and I found that out soon enough. The next day I rowed in to find out there was no room at the inn, at least, not yet. All the spaces in te storage yard were spoken for with deposits on them, though the owner assured me that practicallyu speaking there were 30 spaces left and no expectation that everyone who'd reserved them would actually show up. But he said it would be 10 days before he could actually accept me for storage. But there was room in the workyard, at $12/day, vs the $3/day for storage. I didn't see that much choice except to waste time otherwise, so I hauled out the next morning and got to work scrubing the boat clean. Though I did a lot, and worked hard, it turned out to be a real fiasco in the end. While I did accomplish a lot, I also wasted a lot of time. I wasn't prepared to do the job, though at first I thought I might be able to do the whole thing and get it over with and back in the water right then and there and save the dry-storage fee. No such luck. Many things came off smooth.. my dad came down and gave me a ride down so I could pick up the truck, left in the keys. I touched base with a few people, loaded up the gear and was on my way. In the morning I was in Miami buying the epoxy paints I needed. Then I was back at the yard.. next was a run in for steel and various odds and ends. But when I tried to get to work the trouble started. I hadn't actually used my tools for three years, and everything was not only scattered and disorganized, or I had simply forgotten what I had and where what I did have was in all the buckets and toolboxes. But worse, the power tools I really need, the dander and the grinder, both went out on me when I tried to use them. I wasted too many hours, too many days, searching for parts.. though I did get them, or ordered them. In the end I was jury-rigging brushes that I'd hand-made for my grinder three years before (a thing I'd forgotten), that would take me an hour or so, then they'd last half a day. My intention had been to just leave the boat, and come back in the winter after I'd had time to organize and overhaul my tools, and search out and gather the materials I needed, while it cost me $3/day, not $12. Still, I did a lot of work, even if it took two or three times as long as needed. But by the time ten days was up I still was waiting on parts and tools ordered, and dealing with constant daily thunderstorms with pouring rains; and knew I had to go. So I arranged the move to dry-storage, closed up the steel boat, and loaded my gear and my cat into the Hurley. Well, the adventures just never end.. though I was frustrated and just a bit disgusted. I mean, I have always taken pride in the fact that my adventures wre well planned and prepared for, and I did what I set out to do, with really a minimum of the trials and disasters that seem to be the theme of so many other people's road stories. Yet here I was, dealing with that same sort of chaos.. though if I had been able to follow through with my plan not to work on the boat just then, I could have avoided most of that crisis of unpreparedness. So I had some comfort in knowing that I had been right, I wasn't ready to work on the boat yet, and really, I had just made the best of a bad turn of events. These thoughts were on my mind the morning I motored off in the Hurley, headed for Stuart on the east coast and my friend Rob's place by the water; glad to be back on the track of my original plan. A few miles later, the outboard died for good. Or at least untill I can get the gaskets and rebuild kit for the carburator. Frankly, at that moment I was a lot closer to the middle of nowhere. So I did what I had planned to fall back on in this case, hauling up the sails and keeping moving. It was really quite a mildly amazing thing, as I watched myself do it, as I look back on it. The sheer stubborness on one side, the sailing skill to make it, the perseverance to just keep on despite it all. Though the wind was fickle and I was ghosting along at times, even rigging the oars as well, I made it to the first town.. Moore Haven. The wind had died, but then picked up as a huge wall of black clouds screamed in from the south. I tacked the final mile below the town in minutes, counting seconds, telling myself I had to stop... had to get the sails down...NOW... had to make it a little farther to some trees that would give me shelter from wind and lightning.. HAD TO STOP NOW. It was close, too close, as I headed right up to the shore beneath those trees and dropped the big anchor and clawed the main down as the wind began to bend big trees like rubber toys. I threw gear inside and got the hatches shut just as the rain came pouring down, then got harder and heavier, stinging and cold in the now howling wind. I rowed the other anchor out and set it with the dingy to hold myself off the bank if the wind shifted. I remember finally standing on the deck again at last, stripped to my shorts, letting the rain wash me for a moment, feeling almost like I was being buffetted by whitewater in the force of wind and rain, the really physical impast of the deafening thunder, blinding flashes of lightning. I was cold and awestruck, almost numb as the energy of urgent action slipped away. I went below to dry off . I lay down and wrote, and read a book written by one of my friends back in the Keys. In a lull in the storm I managed to rig a little overhang for the cimpanionway and cooked dinner. I was really content at that moment. That age old feeling I think, achieving shelter from the storm. I watched the sunset into storm clouds, then lit a candle and read, then slept while storms muttered in the distance, and broke over us several times. I would wake, and see all was secure, and sleep again as the rain poured down, drumming loud on the deck above my head. In the morning I realized, from the amount of fruitless searching I'd done for easier things while still at the boatyard, that there was really no chance of geting a rebuild kit where I was. I had a light breeze blowing the way I wished to go, so I hauled up quick and went. Reaching the locks I radioed ahed that I was under sail without engine and moving slow. They said to just come on through. The lake was so low that this lock wasn't even closed, so I sailed through, wing and wing. But this didn't last.. as I turned the corner past the lock, looking forward to a steady reach down the canal, the wind perversly shifted to put my course dead upwind. I was having to tack up the channel, only a few boat lengths wide at some points, and never more than four or five at best, certainly not the deep water.Like some crazy game of chicken, I would sail right at the one bank of dredged up jagged boulders, then come about at the last minute to do the same at the shelving, muddy bank opposite, the side puntuated by stetches of stumps and sumbmerged logs. I ran aground on that shallow side several times. The first time I immediately jumped overboard.. the Hurley only draws three feet, and simply spun her around and lept back aboard as she fillled and pulled herself off the bank. After noticing the almost constant progression of resident alligators along that same bank, I kept an oar handy to push the boat around instead. It was funny, how the animals, and the people coming by in massive powerboats, stared at the strange apparition of a boat actually sailing up the canal.. I felt like many had probably never seen such a thing before. Then the storms began to build, and the wind as well. What a day. Though no storm hit me dead on, they were near enough to produce heavy winds at times and gusts that knocked the hurley right down a time or two. Yet she really showed her stuff, showing the qualities that make a Hurley one of the "great sailboats", as she handled solid and held true through what was really a pretty tough trick to pull off. But by late afternoon we made liberty point. There was a small lagoon to the north where a couple creeks joined the channel, a rare bit of shelter in what amounted to a canal. There the canal turned dead to windward, and became even narrower, barely three boatlengths, with the wind just funnelling straight down it. Figuring this might be my last chance for shelter before dark, I turned about.. though the only way to do so was to nose her into the bank first. The lagoon was in a quiet lee, and I decided to stop there and try one last time to get the outboard to function. I removed and cleaned jets and reset the idle more open and somehow (I realize more by luck than any actual repair) it started and ran. So I left it and rowed ashore with the cat for a wlk at some docks oposite the lagoon, taking some rare pictures of the Hurley from shore. While I was quietly working on the engine, I'd also noticed another thing, alligators. Lots of them, lots of small ones, several big ones, and one monster that put me right back in the paleolithic. Later, as the sun sank, it was an almost primeval world, with the dark ridged reptilian silhouette gliding across the still water, the hoarse birdcries, the surrounding banks thick with tall reed and low broadleaved undergrowth. After dark, just before I went below, by the barely visible bank 30 feet away, there was the sudden splash and white flash of spray outlining for a second the lunging dark body, then the rhythmic thrashing struggle of its captured prey, slowly weakening, then stillness. I released a breath I didn't know I was holding, and with me, the sounds of marsh, paused for a moment, began again; life goes on. In the morning, The engine started and I headed up the canal even as storms moved in, pouring rain down on me before I'd gotten a mile. But I made it to the next town and anchored there, where the canal split into alternate routes, one hugging the bank and the other cutting across the lake. I rowed in, needing water definitely, and a few grocericies if I could get them, and making phone calls to update everyone on the situation. Especial Rob, expecting me in Stuart a few days after I left the boatyard, but I had barely made it a quarter of the way in that time. Though the weather was bad, it also looked possible right where I was, so I took a chance, and a fair wind, and headed out wing and wing across the lake to save quite a few miles. Halfway across, I was hit and pounded by squalls and building waves, dropping the main and running under the jib. The only bad moment was when I came into the wind in the face of a squall to drip the main and suddenly faced the full force of the wind and wave, a top batton instantly cracking in half across the upper shroud. I had studied the chart and expected this, and kept up sail and raced to make it to the cut through "rocky reef" where I could turn down and run the rest of the way under the jib alone if need be. 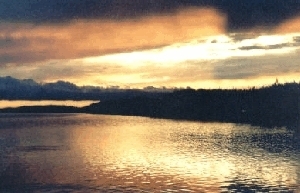 But it wasn't going to work, first, I wasn't making enough speed now to make the entire crossing before dark, I lacked and hour or two possibly, and the idea or racing down onto the locks and a lee shore in the dark and storm did not appeal. 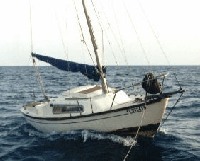 As a last straw, the dingy was surfing down the waves and ramming me hard astern, endangering itself and the outboard. So taking a quick look at the chart, I cleared the reef and turned east, direcxtly towards shore. I'd still cut off the long detour around the lake, but I could make it by dark, barely, according to my calculation. So I held on under the jib, spray flying, quartering the waves now so the dingy stayed back. 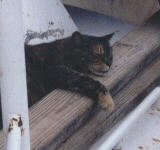 Suprisingly, amid the wild tossing of the boat and the spray, mty cat came on deck, and though she wisely gave up on the cabin top after a minute, she layed down in the cockpit with me and watched the waves and stormclouds. The wind died just as we reached shore at sunset and I ghosted in close as I thought wise, just outside the channel markers, setting both anchors as new storms heaved up black to the southwest. Just after I'd finished dinner it hit, a monster storm, that lasted half the night, and we rode it out there, tossed by wave, listening to the pouring rain and thunder. I got up early and made coffee as I hauled up the sails. I expected as bad or worse again today, yet knew I could expect it to take a few hours to build. I crossed the edge of the channel and turned to run north along shore. Here there was no protection from the waves coming off the lake, yet from the chart, it seemed there might be some banks just before the lock, so I made for them in the steadily building wind. I droped the main as the first squalls moved in, then got it up again as they passed, racing for the hope of some shelter. Just short of the locks I was proved right, cutting behind a long bank of submerged shallows with reeds and water plants growing up to break the waves.. not perfect but actually real shelter. The main was already down again, and I dropped both jib, intending to glide slowly to a good spot. Instead, the wind was so strong it heeled her over and she spun about and darted for the all to near bank. Again, I was .. shall we say, lucky that I am not one who depends on luck? I had my big 35 lb cast iron danforth sitting in the cockpot, rigged with heavy chain and led around and up to the bows and made fast there, ready. It was the work of a few seconds to grab it and heave it over the side, where it jerked us to a halt in 4 feet of water, 10 feet from the bank. As the rain spattered down, I rowed out and set the other anchor and pulled us slightly farther off. Though it was still just early afternoon, I knew there was no way I would attempt the lock in these conditions. I saw big motor boats comming in, struggling with the seas piling up at the entrance, and settled down to get some much needed recovery time. I went ashore to climb the bank and take pictures again, and the wind was so string, I had a hard time holding my own to make the 20 feet to shore! I also got to work on the outboard, this time discovering that the gaskets had blown in the carburator and it wasn't going to run again without a rebuild, my only option was to sail the rest of the way. The wind howled, though only occasional squalls passed through, all the major storms missing us that night. I woke to fog, but just had coffee again and got going, determined to get through the lock and into the sheltered canal past it, and to waste no more time ponned down by the weather. I radiod the lock and he asked that I drop sail, though this lock was also open, and let him line me through instead. But the wind was easing more than building, and I dropped all sail at the entrance and towed the hurley in with the dingy, then grabbed the line nd let him walk us through. Past the lock I raised all sail and caught the light downwind breeze. What a day. I got the genoa out and up for the first time in years, discovering a large rat hole in it.. luckily only one. The wind blew light and I moved along slowly but steadily. Then as as storms built it rose and I changed back to the jib. I had a good run for a few miles before the wind started to get gusty and fluky, then it dropped all together. Finally I towed the Hurley with the rowboat to a slightly better spot, and anchored just before a storm hit, using the time to finally make something to eat. Through the rest of the day, I struggled with tacking up the channel against light variable winds and calms, rowing again sometimes rather than not move at all, but making more miles before I anchored for the night just before another big storm hit, and I rode it out, comfortable in the protection of the narrow channel. I still recall so clearly thinking that despite all the trouble and the fact that I was making little progress often enough, I actually was quite content. If it wasn't for the fact that I was running so late into the spring season, I'd be perfectly happy to move along like this. Perhaps that is what makes me a sailor,and a walker, that I can be content with this slow pace of life, with the hours of watching the slow unfolding of the shore, lost in thought, or thoughtlessness, endlessly tending sails and tiller, at one with the ship and the clear facts and facets of nature, the zen totally aware unconciousness, as minutely observant and watchful, yet as calm and realxed as any animal in the wild. I am not impatient, not bored. I would be glad to keep on this way, knowing eventually weather will be fair and I'll come to a town and find a place to play music, till I am burnt out from that and it is time to sail on again. The next morning the wind was again light to non-existant, and I was rowing with all the sails up and ready, then tacking, finally starting to move as the wind shifted slowly around. I reached Indiantown Marina, and anchored to row in and get water again and call Rob. I told him where I was and that the outboard never ran after the last time I called him. But I also said that the wind was starting to go right for me and I would ride it, so I skipped groceries and grabed my water and got back to the boat. It turned out to be a great day. The wind built to my quarter and steadied. I ran hard all day right down the channel, dropping the main only once for a passing squall. The Hurley was running broad, and all the storms kept their distance. In the best run of the trip I made it all the way to the stuart locks before the luck ran out. While I waited for the locks to pass me, the wind died and ominous squals moved in from the north. I dropped the jib and towed the Hurley in instead of risking the chance the squall would hit as I manuevered into the lock. Instead, it hit while I was in the lock, it was that close. But now, I couldn't get out.. the one other motor boat that had been in there with me refused to give me a tow. the wind was too strong for me to tow against by the time I reached the mouth of the lock, and I ended up steering over to the wooden palings at the entrance and handing myself along them dragging us out, pinned to it by the growing wind. In a nice bit of seamanship though, I raised both sails,and levered myself off the end of the pailings. We were head to the wind drifting backwards between the paling fence and into the bank, a concrete wall, when I ran forward and used a piling to force her head the last bit around and raced back again as she caught the wind in her teeth and lunged out the narrow gap. In the face of the sqaull I hard tacked back and forth, slowly leaving the lock behind. But within an hour, the wind was dying again and I was tacking slower and slower. I'd reached the interstae 95 bridge, and looking at the chart I could see I needed to clear it and a couple markers more to get beyond the cable and pipeline area around it so I could anchor. So I sailed on in the dark, ghosting along, but moving steady, taking a couple hours to work through that last stretch. Finally anchoring for the night while storms muttereds and flashed in the distance. But none came near and we slept steady in near calm water. We were hanging off our anchor come daylight, even though there was just a breath of wind.. so little the only way I could tell was with the bit of hair that comes off my cat when I pet her. But I saw it, a current, heading down the canal, heading out to sea, the tide! We were in tidewater! In a rush of exitement I brought up the anchors and raised the sails, though I had to use an oar to turn her down "wind", there was so little of it. But the tide was moving us, and we drifted quietly down towards the sea. Then moving steady as a breeze sprung up. As I round a bend, a classic wooden ketch is motoring up past me, I wave, and notice the name.. it is the "Dawn Treader". I feel good. The wind builds fast, and soon we were going great even down the twisting passage as the staight canal had given way to the bends of a natural channel. Then we turned a corner and the wide river openned out before us and we raced out into it. The wind was still building, and as I raced down to the first bridge, a sailor motoring in the opposite direction yelled a warning, that they were predicting 25 to 35 knots that afternoon, and it was getting ugly around the point. I kept on to make the most of it, still downwind which lessens the force of it as I run with it. I was in luck as well, and was able to have the bridge openned as I came up to it and raced through. Beyond the bridge though I was turning to take the wind broadside, and was left luffing much of my mainsail and still getting pushed down hard. But I bire up towards shore a bit for shelter, and before I cleared the point into the full force of the wind, and the turn that would take me head into it, I turned in close and anchored. But I wasn't stopping. I managed to use a large screwdriver to turn the reefing mechanism on the mainsail and put in two reefs. I also studied the chart to see what lay ahead, bridges and narrows and the huge sweeping "S" turn I was following as I ran out to the river's mouth, to the Atlantic. The words that stood out were printed over the narrows past the next bridge, "Hellgate". "Now that doesn't sound good" I said to my cat, and I was right. I headed out into the teeth of the wind, strong but steady and not unmanageable anymore. The Hurley is a gem of a ship for sure, and proved it again in the narrow tacks under the bridge. There I was almost wrecked for the second time in the trip by a motoryacht with a stupid ignorant fool at the wheel, trying to get by me despite the fact that I was tacking through a narrow opening between two walls of pilings. I missed being hurled against them stern first by no more than a foot, after dodging them as well. But within an hour I was approaching The Hellgate and noticing that I was not only not making headway, I was losing ground with each tack, as the dunnelled wind and incoming tide forced me back. Looking at the chart I saw a way to possibly cut to the other shore and come up along it, on the other side of a shoal from the channel, before cutting back in just off the point. I went for it and it worked. Though once again the Hurley shone as a great boat as we leapt out from behind the point into the full force of wind and tide. Even with the reefs she was cutting hard and I had one chance, a fast pass across to the other bank, then turn her tight to the wind and head to the tide and claw our way straight out. And she did it. Through the peak of the tide and the wind howling down the narrow throat of the bluffs. The channel again only a few boat lengths wide, with only a foot of water on the shoals. Finally we had to tack, but we had cleared the gate. But only a slight bit further and only a half mile from the turn that would take us broad to the wind again, we were stopped at marker "13". Here the narrow channel was all there was between a quarter mile of absolute shallows, and the tide was still rushing in. Yet here, past the narrows, the wind had eased, or perhaps was easing all together as the day waned. I did what I had to, eased off just outside the channel and anchored till the tide eased, only an hour now. I can see the Atlantic through the pass, and smell the salt on the wind. So I made a cup of green tea and finished the book I'd started on this trip. The tide has eased, but so is the wind, but the hurley shows her stuff and we tight tack up that narrow cut till we finally make the corner. At that point I manage to get the reefs out of the main without stopping and then I turn her broad to the wind and race up the short stretch to the Indian River and Stuart Pass. I'm not going to sea again though, but turning North and running downwind again, up the Indian River, the final leg to Jenson Beach and Robs house. I'd already come here once to drop off the truck, walking out a dock to get bearings for coming in. The wind was easing, and a wall of storms working its way in from the west as I passed through the last drawbridge and made for Robs, still a good few miles off, but in sight at last. Well in sight till the sun set, but I'd taken a guess on where I thought it was, and marked it relation to a few bright lights showing as the dusk deepened to dark. The wind had eased to a light breeze, too lihgt, as I could hear the thunder now from the approaching storms. I eased in to shore, up to the 5 foot line and followed it till I was abeam of Robs boat, a shallower draft sailboat anchored close in. I turned in till the bottom started up and cast the anchor. I dropped the main and let the chain out slowly, but to my chagrin, as I reached the end, I noticed that the wind had shifted ahead of the storm, which was almost there, and was pushing us the other way, laying the cahin in a big "U" . Well.. haul it up and lay it agin, the out with the second anchor, then gathering up a cat food and cat and a small bag I tossed all and an anchor for the rowboat and headed for shore as the wind bagan to pick up and gust. I laid out food and water on the hood of the truck and let the cat off to explore, then was letting myself in with the key he'd given me as the first drops spattered down. Well... so the voyage is done. I was actually right on time. A few hours later Rob came home, seems his car had broken on the way home. So the next day I was able to use my truck to take him and his tools there, and after trying in vain to get it going, tow it to the parking lot at the place he worked. So I spent a couple days emptying the Hurley and readying it for hurricane season. I dug out the heavy shipchain, ground chain, and anchors and set them out. In the shallow water I could almost walk carrying them, but not quite that shallow. Perfect for the Hurley's 3 foot draft. But I was, of course, running really late into the season, a fact I was facing with resignation and acceptance, as I carried on and did it, made it happen, through all the obstacles and delays. But I stayed no longer than I had to, and in a couple days I was headed north to my dad's house in Gainesville. And a few days after that I was driving up the east coast to Virginia, mulling in my mind all I had to do when I got there. When I got here. And here I am, back again. The circuit rolls around, my extreme routine, this same place, yet of course, different stories again. I jump in and go at it day and night, not enogh time to do it all, juggling plans I've had to change, dealing with more emergencies as well.. more delays. Its that type of year I guess. But I am dancing through it, and though it is so close, and I lay awake at night sometimes wondering, and actually tyrying to convince myself, how I can manage to pull it all off. At this point, by getting a van, piling everything in it, and taking all I have been unable to do with me! In essense, that is the idea of the van. That now I have my studio everywhere I go, and the fact I have to move doesn't force me to put off making progress on my projects for months till I get back. I'll be able to achieve continuity and like with the boat, keep plugging away, fast or slow, whenever I have the time, only pausing to do the other things in this life I juggle. Then able to take up where I left off, and keep on balancing everything, each getting enough attention to keep it in the air, different energies peaking in waves, and everything happening in one whole, moving steadily forward on all the diverse fronts.